Hank Chen, video blogger with the Ford Fiesta movement, crafted this video about his Friday Ithaca experience, including his firewalk. I hope to post JW Harvey’s Huffington Post column on his experience here shortly. This entry was posted in Firewalk, LGBT on August 13, 2013 by Firewalker. Firewalking has existed for thousands of years as a spiritual practice that aims to strengthen the mind-body connection of an individual. It demonstrates that people have control over their own bodies, including the tolerance of pain and the ability to transform bodily limitations by tapping into spiritual powers. Ancient civilizations have practiced firewalking as a religious ritual and healing ceremony by priests, shamans, and ordinary people. In fact, scholars estimate that people have practiced this ancient art since before mankind could record historical events; however, no conclusive evidence points to where and when firewalking originated. The earliest known record of firewalking occurred over four thousand years ago in present-day India, where two Brahmin priests competed to see who could walk furthest on a bed of coals. The Ancient Romans rewarded citizens with a tax exemption if they could demonstrate their ability to transcend pain by walking on fire without incurring burns. In Africa, the Kung Bushmen tribe danced around a fire as a powerful healing rite, a ceremony that also included rolling on the fire. In addition, families celebrate the coming of age for their seven-year-old daughters in Bali, Indonesia. The Kahunas in Hawaii allow molten lava to harden enough to old their body weight before walking over it. Other countries have practiced fire immunity and firewalking rituals, including Brazil, Burma, China, Egypt, Bulgaria, Australia, Fiji, Hawaii, Indonesia, Japan, Malaysia, India, Haiti, New Zealand, Singapore, Spain, Pakistan, Thailand, the Philippines, Trinidad, South Africa, Sri Lanka, and Tibet. The global firewalking movement, as influenced by Tolly Burkan, emerged in 1977. Before the birth of this trend, firewalking was seen as an obscure and mysterious ritual up until a popular magazine called “Scientific American” had printed a “how-to” article that described the firewalking process. Tolly Burkan reported trying the firewalking experiment, and instantly shared it with as many people who would listen to his inner-transformation. In fact, Burkan attributed this experience as his motivation to offer firewalking as a valuable service to the general public. Burkan’s firewalking research revealed that no other spiritual practitioner could agree on why people remained unharmed when they walked over red-hot embers. Inspired by this research, Burkan exclusively offered his firewalking classes for the next seven years until others came to the forefront. In 1979, Tolly Burkan convinced his followers to use firewalking as a form of exercise for personal growth. Burkan had written a best-selling book and conducted dozens of self-help seminars since 1973; therefore, his followers were less reluctant to accept firewalking into their own personal regime. In fact, Burkan added firewalking to his public seminars as an avenue towards expanding self-awareness, overcoming fear, and eradicating limiting beliefs. Burkan took a risk in introducing firewalking for this very purpose; however, it slowly proved its effectiveness as a time-tested treatment that changes lives forever. Burkan continued to teach firewalking to his students on a limited scale until 1982, when he started to advertise his firewalking courses aggressively. The masses overwhelmingly responded to his firewalking brochures, insomuch that it became sensational in the media. In 1983, Burkan contacted several media outlets to share his vision of a global firewalking movement that would transform the world into a better, more peaceful place for everybody. Unfortunately, mass media outlets rejected his “vision” as a trendy fad that people would soon forget after time lapsed. Bulkan also met and taught Tony Robbins, a modern self-help guru, how to firewalk in 1983. The young, enthusiastic Tony Robbins loved firewalking so much that he promoted and turned the exercise into an international sensation, fulfilling the dream that Bulkan envisioned for over a half decade. Tony Robbins’ targeted the celebrity market, which suddenly converted many public acclaim figures to the art of firewalking. Burkan’s firewalking classes expanded to Europe, and soon grew to include firewalking instructor courses in 1984. In 1985, Burkan refined his firewalking instructor courses that would no longer require prospective students to accompany him on road tours. In fact, the new system simplified the training process by keeping all of the prospective students in one place, where they would perform multiple firewalking sessions every day for one week. Not only did this decrease the stress on both the trainers and students, it saved prospective students thousands of dollars. This made the firewalking instructor courses more accessible to people who felt drawn to teaching the fine art of firewalking. Corporations and small business owners started to incorporate firewalking sessions into their management training programs as a means of inspiring creativity and visions in their employees. During the 1990s, Burkan trained over one thousand firewalking instructors who helped empower corporate managers to overcome their limitations. Burkan also had competition from phoneys who never received his firewalking instructor certification. In fact, these imposters decided to teach their own firewalking courses, which ended in disaster for those who participated. As a result, people became leery of participating in firewalking exercises due to the negative media coverage of these tragic events that ended in serious injury. Tony Robbins developed his role as a prominent firewalking instructor in the corporate sector, while Tolly Burkan conducted firewalking courses on college campuses across the United States. However, many corporations sought out Burkan directly after discovering that Tony Robbins formatted his courses after Burkan’s “Fear Into Power” self-development program. Unfortunately, this hastened Burkan’s physical deterioration that started in 1975, when a car struck him in a cross-walk. In 1987, Burkan’s career was stunted, when his body suddenly became paralyzed, requiring reconstructive surgery on his neck. However, his legacy still continued to live through Tony Robbins, Charles Horton, and other self-help gurus who taught inner-transformation by walking on a bed of coal. 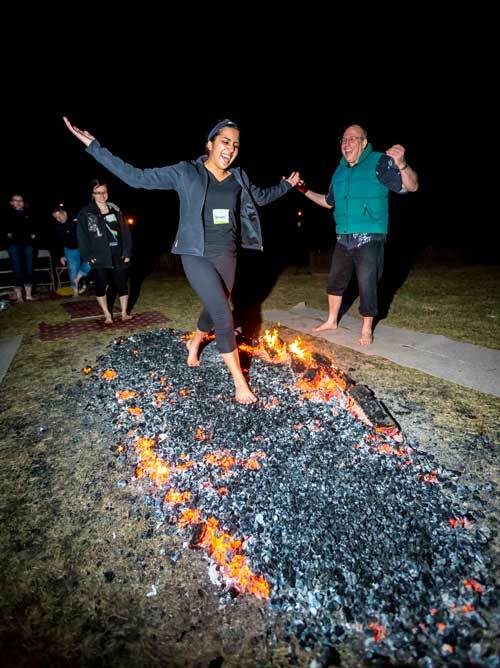 In 2006, the United States military contacted Burkan directly to help design a firewalking course for Basic Training, a feat that Tolly realized gained the exercise credibility. Today, people from all over the world obtain F.I.R.E. certification to help others reach their own goals and aspirations in life through the fine art of firewalking. This entry was posted in Firewalk on September 12, 2012 by Firewalker. 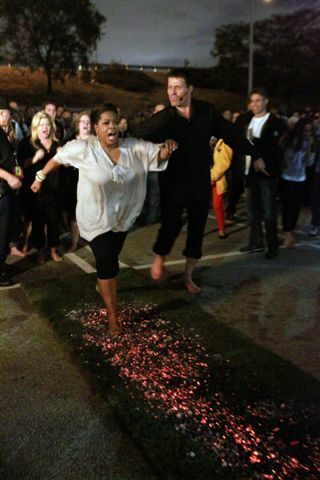 In the last few days, a story broke about 21 people getting treated for “second and third degree burns” after a Tony Robbins firewalk with some 6,000 participants. The president of the Firewalking Institute, which trained me (and Tony Robbins many years ago) has issued this statement about it, and it reflects my thoughts. Put less diplomatically than he does: The reporter was sensationalizing when he reported a single number that combined 2nd degree burns, which are small blisters that usually heal completely within a few days, and 3rd degree burns, which are more serious. I might also be overly sensitive given my vested interest, but I have to think that when a witness said “it sounded like people were being tortured” that the witness or the journalist was exaggerating just a little bit for dramatic effect. There is typically loud music and enthusiastic chanting at such events, 6,000 voices… and it strains credulity to assert that the witness was able to hear much over the sound of 6,000 people enthusiastically chanting. I want to know how many, if any, third degree burns there were. Between myself and the instructors at the institute, we have lead several hundred thousand people through the fires, and have not witnessed ANY third degree burns. So, even one is noteworthy. There may have been three, as that is how many sought medical treatment beyond the first-aid booth. If that is the case, I am curious about what went wrong given the extreme rarity of such injuries. The Firewalking Institute of Research and Education, or FIRE, is a world-class institute that internationally certifies firewalk instructors to the highest standard of safety. We, at FIRE, feel compelled to respond to the media coverage regarding the recent incident involving the firewalk experience at the Tony Robbins Unleash the Power Within seminar in California. Media report that subsequent to completing the firewalk experience, 21 of the 6,000 event participants sought medical attention for second- or third-degree burns. We can examine the odds, and consider that 21 out of 6,000 equates to a 1 in 286 likelihood of receiving a second- or third-degree burn in this particular event. The lifetime risk of death from riding in a car is 1 in 84, a custom that is seldom given second thought. The distinction between second- and third-degree burns is critical. Having conducted many firewalks, we have seen no third-degree burns in our participants. We have seen occasional second-degree burns that manifest as small blisters, similar to blisters that are commonly experienced on one’s feet after walking a certain distance in ill-fitting shoes. These blisters typically disappear completely within a few days. We have instructors who have firewalked hundreds and even thousands of times without ever requiring medical attention. FIRE was not at this particular event, however from previous experience we are confident that Tony Robbins uses the utmost care and responsibility in conducting firewalks. Participants are well aware of possible risks and partake at their own discretion. When facilitated by experts trained to the highest standard of safety, the firewalk experience is very positive and life-changing for most participants. We maintain that, when facilitated properly, the probable benefits of the firewalk far outweigh any potential risks. A few months ago, I was introduced to the work of best-selling author and life coach Tony Robbins while writing about Oprah’s 5,000-person live “Lifeclass” at Radio City Music Hall for OWN: The Oprah Winfrey Network. Robbins was appearing as Oprah’s guest teacher. I was immediately taken with his charisma, his power and eloquence as a speaker as well as his big heart and caring to help people develop strategies to improve their lives. A few weeks after the show, I did a comprehensive interview with Tony Robbins, in which he reflected on his work and impressive career (which has included popular seminars for millions of people around the world and counseling people such as President Bill Clinton, Nelson Mandela, and Mother Teresa) and his own personal life experiences. He invited me to attend one of his upcoming seminars, something I was looking forward to doing. At the time I joked with my family that I might be expected to walk on fire, which I knew from my research was a very transformative part of his seminars that he uses as an experiential “metaphor” for creating breakthroughs and facing and overcoming our fears. So that is why, when lazily scanning my Twitter feed a week ago, I was surprised by a headline saying two dozen treated for second- and third-degree burns at a Tony Robbins event. I clicked on the story, which painted a horrifying scene at the four-day “Unleash the Power Within” seminar in San Jose, Calif., where it was described that the event ended with participants wailing in pain and agony. I sensed something was wrong with the story. I knew that the fire walk exercise was a practice Tony had been incorporating into his seminars for more than three decades and that it was a very carefully monitored exercise in which attendees voluntarily take part, are well-briefed and prepared for hours beforehand, and appropriate precautions are implemented. I do remember hearing that a very small percentage of people might experience minor blistering, but usually for the few that do, it is seen as almost a badge of honor and certainly nothing to cause much concern. Such was the case with Arianna Huffington, who wrote in her book The Fourth Instinct that she had done the firewalk and had the blisters to prove it. As she elaborated in an email: “It was a powerful experience of the inner strength we have to create the lives we want, not the lives we settle for — an inner strength greater than we often give ourselves credit for. And my tiny blisters were a reminder of that!” The stories proliferating on the Internet didn’t sound right to me, and I decided to investigate. When I looked into what three of the medical professionals who were actually on site treating people had to say, they shared their disappointment and frustration with the media reports that they say disregarded the facts for opinions of people who were not directly involved in order to create a sensationalized and inaccurate story. I also reached out to Robbins himself to find out what he had to say about what actually happened at the San Jose event. Those who participated said the young man must not have realized that seminar participants are encouraged to yell and scream to psyche themselves up and they were not all screaming in physical pain. The article in the San Jose Mercury News was taken at face value, and like a bad case of telephone gossip, repeated and embellished across various media outlets around the world with even more severe and shocking titles to grab people’s attention. Fox and Friends took the liberty of stretching the truth farther by reporting a “hot coal catastrophe,” stating that two dozen people had been hospitalized with second- and third-degree burns, which then became quickly duplicated by others in the media. According to the medical professionals on site, while several participants received minor burns and blistering and received medical attention on site or afterward, these exaggerated reports apparently became the basis of a story then told around the world. Dr. Bart Rademaker, M.D., a plastic and reconstructive surgeon who was a member of the on site medical team, said he was incredulous about the misleading news coverage. Glen Lechtanski, who is a certified emergency nurse with a masters degree in burn and emergency trauma and Tony Robbins’ director of medical operations at live events who was also there on site, confirmed his account. Dr. Rob Phelps, a podiatrist, was the third member of medical team at the event. “I not only volunteered to be on the medical team for a second time, but I also brought my wife and two teenage daughters. We had a wonderful experience. In my previous walks I had not burned. I had some small blistering this time (second degree) hotspots, like a sunburn on my feet. They were painful that night but the next day I had absolutely no pain and the blisters were short-lived after that. “Prior to attending this event a year ago for the first time as a participant, my life was overwhelmed with feelings of stress, and that created an unbearable pattern of insomnia that was debilitating to my life. From the tools I learned I’ve been able keep the stress level extremely low, and I’m able to sleep well on a very consistent basis. This is worth more than you could ever imagine to me and my family. It wasn’t only the conjured-up “disaster” that troubled Robbins, but the way the media framed the fire walking without a context as some kind of brazen stunt. Robbins emphasizes that he prepares people for the fire walk for more than an hour and a half and makes clear all the risks involved, as well as all the theories of how fire walking works, including the “Leidenfrost effect,” and the theory that coals are poor transfers of heat. And he adds, “This is really not about fire walking anyway. It never has been. It’s been about getting people to break through their fears and limits. If you look at what holds people back from expanding and deepening the quality of their lives, what prevents them from taking the actions that are necessary to transform their body, relationships, career, business or impact their kids? Invariably, its fear! Fear of failure, fear of success, fear of rejection, fear of pain, and fear of the unknown. In order to get people to know that the techniques they are learning work, I like to use a physical metaphor that tests them to be able to take action in spite of fear. Originally I used sky diving, but as our groups got bigger it became an impractical metaphor. Firewalking became a useful metaphor. “We are trained, almost innately, to be scared of fire and to keep away from it. That is why walking through a pathway of fire is a powerful expression of moving beyond one’s fears. Walking over any hot surface does encompass some risks, but it has been done safely for centuries, and when administered properly can have enormous value as a reminder of what we are truly capable of. And again, it’s not some magical mind-over-matter process. As I tell people in our events… anyone can walk on fire! Anyone can also be up at 5 a.m. excited about their life! Anyone can start their day with a killer workout! Anyone can find a way to master a craft and find meaning in their work! Anyone can have a passionate and loving relationship! Anyone can, but… few people do! What people can do is amazing… what they will do is too often disappointing. And this is the story within the story: the double-edged sword of the media’s power and influence and some inherent problems within our current media landscape, in which outlets often race to produce the most shocking headlines in a competitive 24/7 news cycle in a culture as Robbins puts it: “if it bleeds, it leads.” This episode also serves as a potent reminder to take it all in with a wary, discerning eye and to make sure we clarify the facts for ourselves. It is also an opportunity to reflect on what it says about our own society if cultivating a horror story about 21 people getting badly burned and wailing in agony is more attractive to the media (and its viewers) than the true story of 6,000 people who came together for four days and created breakthroughs in their lives. Since the posting of this article Fox and Friends has come forward and offered Mr. Robbins a rare on-air retraction and correction of their original inaccurate report. See statement below. “During a recent segment concerning a Tony Robbins’ Fire walk experience in San Jose, California, we reported more than two dozen participants were hospitalized with burns. Well a few of the six-thousand received minor burns akin to a sunburn, they received on-site medical attention and continued to participate in the event. Marianne Schnall is a widely published writer and interviewer whose writings and interviews have appeared in a variety of media outlets including O, The Oprah Magazine, Glamour, In Style, CNN.com, EW.com, the Women’s Media Center, Psychology Today, and many others. Marianne is a featured blogger at The Huffington Post and a regular contributor to the nationally syndicated NPR radio show, 51% The Women’s Perspective. She is also the co-founder and executive director of the women’s web site and non-profit organization Feminist.com, as well as the co-founder of the environmental site EcoMall.com. She is the author of Daring to Be Ourselves: Influential Women Share Insights on Courage, Happiness and Finding Your Own Voice based on her interviews with a variety of well-known women. You can visit her website at www.marianneschnall.com. This entry was posted in Firewalk on July 23, 2012 by Firewalker. June’s firewalk was almost cancelled. Six last-day cancellations drove me to fear that I would not have enough attendees, so I called the local attendees I knew, and asked them if they wanted a small firewalk or a rain check — they opted for the rain check. I glumly accepted my disappointment. Then I went out to dinner. My cellphone rang at 7:01pm — a couple had driven from Rochester, 3 hours away, to firewalk — and where was I? They had registered months ago and I forgot. I told them to stay put, promised them a firewalk, had the restaurant pack up the food from the table, and got on the phone. I reassembled my team, got my local friends back into the game, and we were on! I drove fast. It ended up as a wonderful, rich evening. This entry was posted in Firewalk on June 26, 2012 by Firewalker. My friend Erik Lehmann is “The Dream Catalyst,” or that is his nonprofit and his mission. He finds young people who do not have anyone who believes in them, and he helps to make their dreams matter. He brought a young couple to Friday’s firewalk. 18 and 19 years old, engaged. Pregnant. Both unemployed. Both victims of long-term, repeated abuse — physical, emotional, sexual. Oh, and the guy has rage issues where he becomes a “monster” (his word). And that is not all: he is martial arts trained, at competition level. So when he loses control he can do more damage than someone who is not trained. Wow. They were both totally open about their challenges right from the beginning of the workshop, as it explained why they were there: They both wanted to turn a corner and become better — for each other, and for their child-to-be. They both bravely took on the challenges I offered them. They wrote a ton on their boards about what they wanted to break through and towards – and then they broke them. The girl decided not to do the trust fall to protect her baby, but the guy, strapping and fit, said he almost peed his pants over that challenge. Trust does not come easily to people who have faced more than their measure of cruelty. They both broke their arrows and they both walked through fire, joyfully. They said it helped them feel they could handle more than any of those horrible people in their past could dish out to them. I do a bonus exercise for just a few people each workshop – where we capitalize on the elated moment after the firewalk to reprogram some negative self-images. His was “I am a monster.” Hers was that she is worthless. After the firewalk, they each design and proclaim a new truth to the group, until the group accepts they are speaking with full force and full conviction. He announced that he is a loving father and partner, always. She announced that she believes in herself, and she wept. Both received many hugs and much celebration for their new convictions. I asked them both to hold each other accountable for their new stands in life. They were both wobbly and thrilled at the end of the workshop. Other participants noted how they were moved by what they witnessed. I am reluctant to claim to be a healer, but healing happened Friday night. Those young parents-to-be got a look at what it would be like to be free of their burdens. Their challenges are just beginning, of course. Hopefully we can get a good local counselor to work with them for charity. But it was an honor and a privilege to serve them so deeply. I know this experience made a difference for them. Keep the momentum going, shining souls! This entry was posted in Firewalk on June 7, 2012 by Firewalker.